A Mezzanine loan is used by many companies that are need of immediate cash flow to support expansion projects like recapitalization and management and any other type of large scale project. The advantage of mezzanine loans and financing is that it minimizes the need of equity in the business when its merged with the senior debt. Equity is considered as the most expensive form of capital and a cost effective way to create such capital structure which can helps secure the funding. 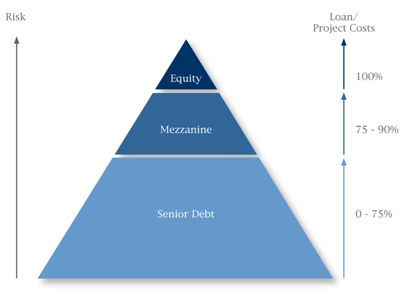 The mezzanine loan is normally structured as it is the bridge between the equity and the senior debt. It fills the gap between the two and always provides a chance to the investor to enhance his business. Mezzanine loan is in the lower category or lower in priority of payment to senior loan, and it is always bigger than the equity. The discounts are charged at a higher extent on the fixed assets and inventories as well as on the accounts receivable. The balance sheets now have many of the intangible assets included. As many defaults have occurred banks have shut down the amount of the total debt that the companies can obtain. It is the fact that equity is the most important and the expensive source of capital and in this regard a mezzanine loan serves as the best option for investors. The mezzanine loan also enables a business owner to boost up more profits and lower the cost of capital by improving the equity returns. There are three cases that can illustrate the capital structure and mezzanine loans. Case 1: Small recaptilization switching over the most efficient capital. Case 2: This is taking the loan typically with the company. Case 3: Using a high degree of leverage and recaptilizing again the optimized structure. The equity returns enables the company owners to lower the risk by reinvesting in the company or giving exposure to other investments to acquiring the other businesses. Mezzanine loan is the mixture of many types of financing. In 1980 it was in the hands of insurance companies and loan association companies. The traditional investors were the long-term planners and they were in the habit of dealing the cash-flow lending. Mezzanine loan is not like the equity participation and interest rates that depend on the economic conditions. The returns and mezzanine notes are the constant figures. The mezzanine loan is a component of both the secondary loan and the amount of equity. Usually the debt life is from five to seven years and the loan is issued at the interest rate of 12-18 %. The rest of it is 15-25% and it consists of the merits to purchase the common stock which the investor values and it is based on the reputation of the company. 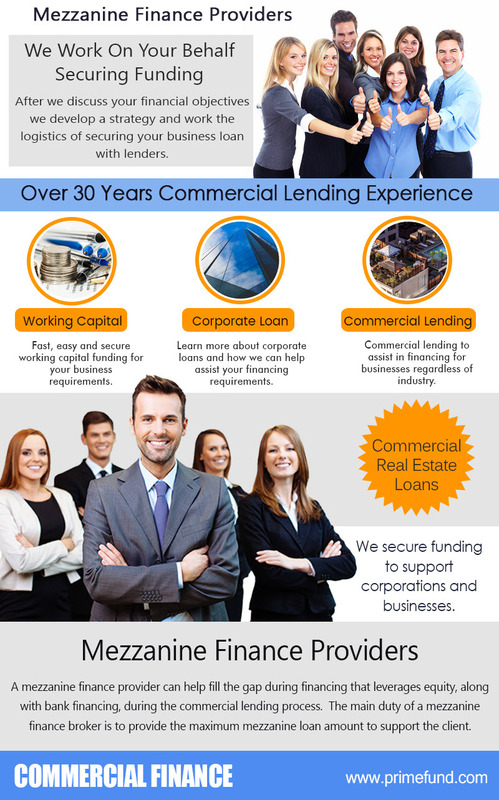 The commercial loan broker’s job is to lend the mezzanine loan for the company with the lowest interest rate. The commercial brokers try to get the mezzanine loan from the companies that are reliable and reputable. It is the responsibility of the commercial loan broker to keep the check and balance and avoid the early exit of the company. Exiting a mezzanine loan is dependent on the economic conditions. The investors take out the mezzanine investments by the change of control sale or recaptilization of the company. Many of the mezzanine loan investors think that the IPO is not real and has no benefit however on the other hand, some of them invest in the companies with the strongest IPO potential. Its really dependent on the investors. Normal mezzanine deals are with the term of 5-8 years. Mezzanine loan is completed by the different other structures and the existing capital structure, mezzanine lenders always look for the maximum rate of return and that come from the four sources. Cash Interest: This includes the payment of cash based on the fixed amount of interest rates or they change with other basic rates. PIK Interest: This is the periodic payment that refers to the payment of the security amount, but not paying the cash interest rate. Ownership: The mezzanine loan is accompanied by the equity stake like in the form of a convertible bond and the ownership is always settled by the cash interest and the PIK interest. Participation: Sometimes instead of the equity payment the lenders demand the return in the form of the total sales of the company and the cash flow and profits. For more information on The Focal Points of Acquisition Finance, visit this page.